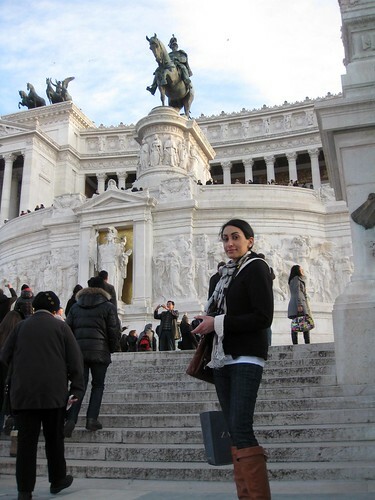 Our last full day in Rome was slow-paced, as Melody and I were both nursing colds that just wouldn’t seem to go away. After an unsuccessful search for a reputedly chic shopping neighborhood in the Marconi district that dropped us off in an area that screamed stoic relics of the Mussolini era rather than boutiques, we left and headed to familiar ground: Campo de’ Fiori. There, we had lunch at Hostaria Romanesca, a busy restaurant that seemed promising. The tourist overflow should have been the first warning sign. 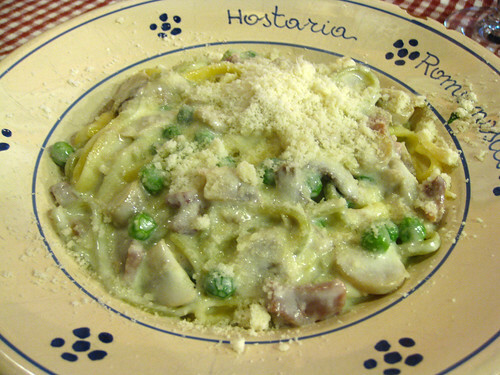 They were out of my first and second pasta choice but undeterred, I asked for the pasta alla norcina, which was so overly rich and cream-laden that the sausage and mushrooms were more like an afterthought than the primary flavors. We knew what we had to do. We couldn’t finish our pastas, but before we left Campo de’ Fiori, Melody and I walked over to Forno Campo de’ Fiori and bought a couple slices of pizza. Much better. We had initially planned on spending our last day in Italy by making a day trip to Pompeii, but because we were both feeling so under the weather, we headed towards the Tiber River after lunch, strolling through the outdoor markets and picking up a snack or two along the way. Gummies are one of my favorite candies, so we stopped at what may be the best display of gummies I’ve ever seen and bought a mixed bag. As luck would have it, we lost the bag ten minutes later. I blame the distraction of the not-so-tasty pistachio gelato that I picked up along the way right after. 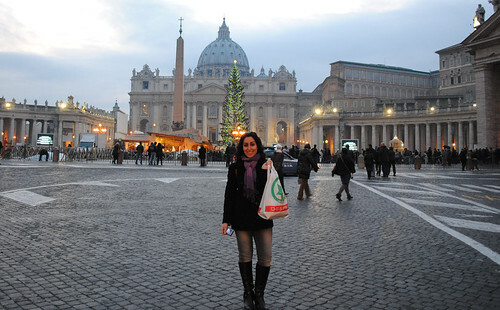 In any case, we continued our stroll until we stumbled upon St. Peter’s Square, just as the neighborhood was getting ready for the New Year’s Eve festivities. We wanted to stay for the countdown, but our stuffy noses weren’t getting any better and we had to get some rest before we got up in the middle of the night to head back to the airport. Bag of cold-fighting tangerines in tow, we returned to our hotel. Just a few hours later, we were back at Fiumicino Airport, waiting for our flight to take us back to San Francisco. Not a bad way to ring in the new year, if you ask me. 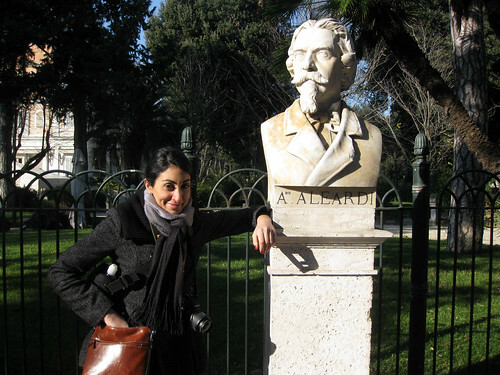 I’ll admit that I hadn’t heard of Villa Borghese until I began planning this trip. 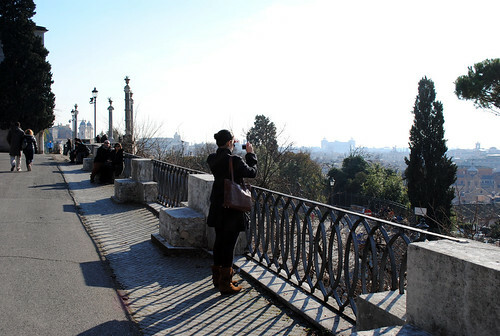 Similar in scope and size to New York City’s Central Park, Villa Borghese houses a renowned art gallery and stunning views to boot. The park is dotted with cafes and gardens, a perfect place to spend a leisurely afternoon after four hectic days. Our first stop at Villa Borghese was a small cafe for an early lunch. I got a salami and cheese panini and we ate our sandwiches while we walked, taking in the view between bites. For a park that began in construction in the 1600s (but wasn’t opened up to the public until 1903), Villa Borghese is impeccably well-preserved. But it’s also seemingly endless, and Melody and I endlessly looped around in search of the lake at Giardino del Lago until we gave up and consulted a map. 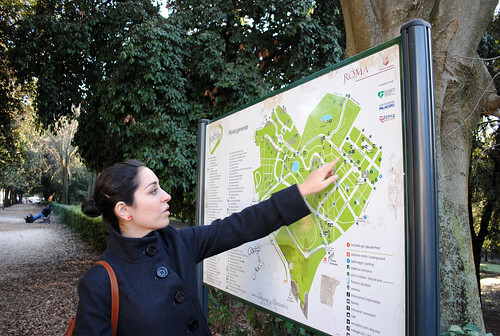 We never did find the lake, but we were happy — Villa Borghese was worth the trip to the outskirts of Rome. We were hungry though, so found our way towards the Tridente neighborhood and decided on Life…Ristorante for lunch. The intentionally placed ellipses are part of Life…Ristorante’s name, and and it was with a mixture of amusement and curiosity that we sat down to eat. I was feeling decadent, so I had the fetuccine with porcini mushrooms and black truffles, with an aperol spritzer on the side. My fetuccine was fresh and perfectly cooked and the truffles weren’t as strongly-flavored as I’d hoped, but satisfying nevertheless. The mushrooms were soft and velvety, a texture I’m unaccustomed to in porcini since they’re usually dried. Melody had the pappardelle with porcini mushrooms and broccoli because she’d caught a cold (that I’d soon catch too) and well, broccoli is a vegetable so naturally that made the huge plate of pasta good for a cold. 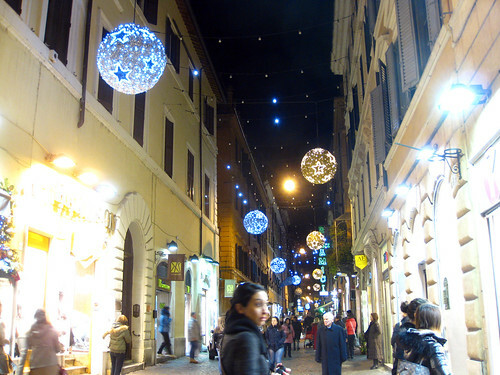 After lunch, we spent some time strolling around Tridente and admiring the narrow sidewalks and chic boutiques. Our trip was nearing to an end, and this is where I began to go into a low-grade panic mode that we hadn’t yet sampled enough Roman fare. 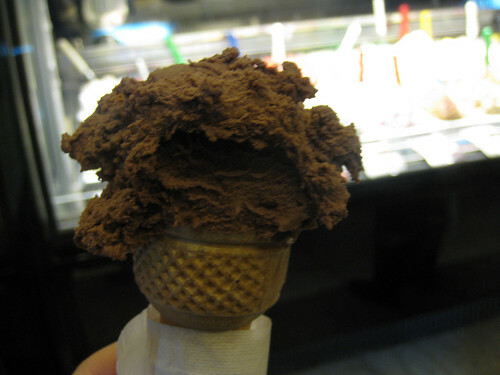 I stepped into the closest gelateria and bought a Nutella gelato. We never did make it to Rome’s famed Gelato di San Crispino, but the gelato at Centurion did the trick. By this point it was getting late, and there were few restaurants in the neighborhood where our hotel was located, so we stayed in Tridente and had dinner at Hosteleria di 31. It was packed inside, with diners practically sitting in each other’s laps, but service was brisk and no-frills. 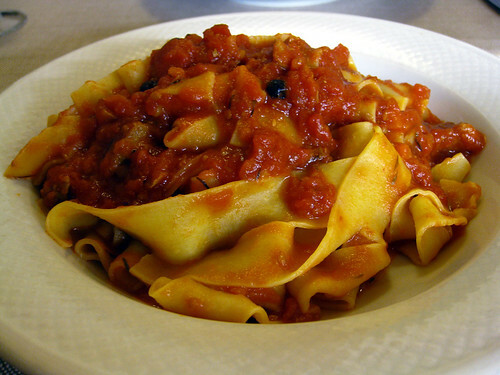 I ordered the pappardelle with wild boar sauce, and Melody had the spaghetti Bolognese. I’ll be honest. I wasn’t even hungry, but I’d never tried wild boar and curiosity got the best of me. It was richer than beef, and the sauce was doused in flecks of black pepper. I probably would have enjoyed it more had I not just downed a plate of pasta and cone of gelato beforehand, but nevertheless, I was sated. We declared our stealth eating mission an accomplishment and headed back to our hotel for an early night in. We picked up a bag of tangerines on the way back to fight our colds and settled in for few episodes of Willy il principe di Bel Air. I’m conflicted when it comes to the Colosseum. It’s among the most stunning sights in the world, but it’s flanked by so many tourists that at the end of the day, you’re too distracted to pay any attention to the towering columns in front of you because you’re busy getting getting shoved into line after line after line. 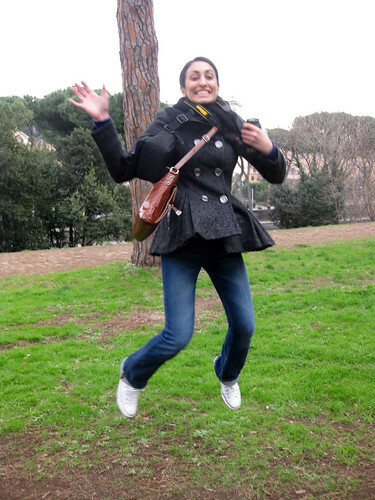 That’s essentially how our fourth morning in Rome began. After standing in a tangled, irate crowd for over an hour, we grabbed our Colosseum tickets and things calmed down from there. There’s not a whole lot to say about the Colosseum that hasn’t already been said. 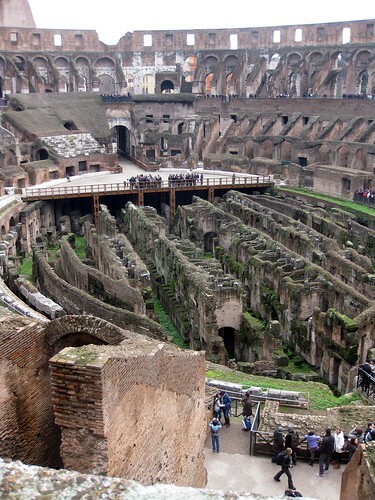 It’s really, really old (built in 72 AD to be exact), and really, really big (it could seat over 50,000 people). We circled the perimeter and made our way across the street to Palatine Hill, which was once ancient Rome’s equivalent of Beverly Hills. Dotted with ruined villas, Palatine is an archaeologist’s dream and the oldest site in Rome that has been continuously inhabited. 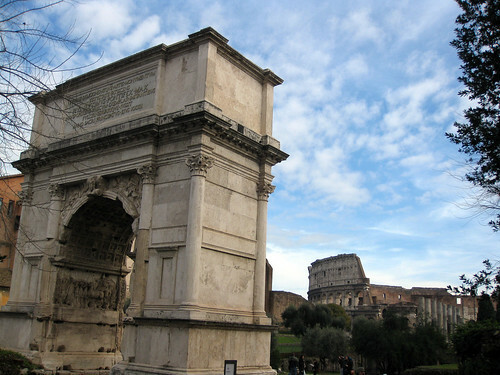 It was also the birthplace of Augustus, Rome’s first emperor. 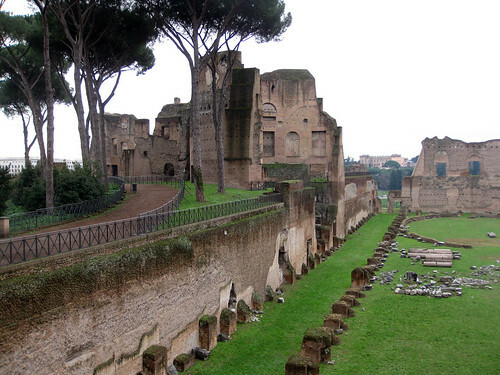 Palatine leads right into the Roman Forum, which was my favorite of the three sights. The ruins of the ancient government of Rome, the royal residence, Senate house, tribunals, and government buildings are all housed here. Not everything has survived the centuries, but it’s easy to imagine the hustle and flow of daily life in ancient Rome at the Forum. 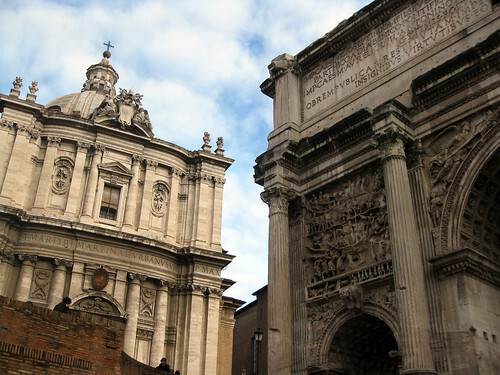 By the time we finished walking through the Roman Forum, we were starving, and the local neighborhood didn’t have many restaurants nearby. Trastevere was next up on our list, so we hopped on a bus in search of what’s touted as Rome’s most picturesque neighborhood. 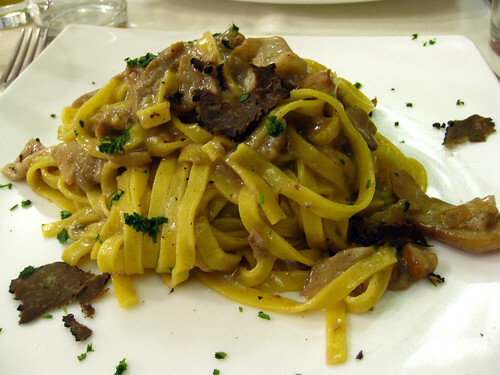 Unfortunately, we got off at the wrong stop, and we were so famished that in our hunt for Trastevere, we gave up and popped into the first restaurant that we could find. I don’t remember the name of this restaurant, but Melody and I referred to it as “Italian Olive Garden” for the rest of our trip, let’s just put it that way. We were craving seafood, so we had the sauteed mussels to start. These were simple and satisfying, though a bit on the salty side. I was really craving seafood, so I ordered the seafood ravioli as my entree. I take back what I said about the mussels being salty. No no, this was salty. 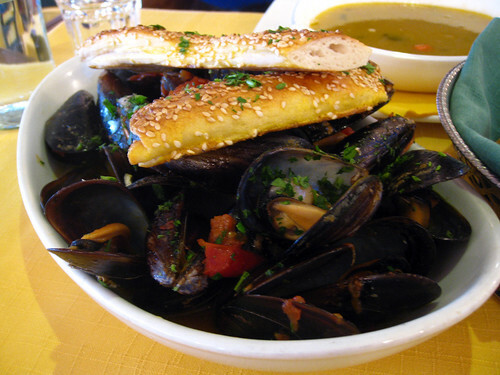 The sauce was essentially the same as the mussels, but with an extra few spoons or so of salt thrown in for good measure. 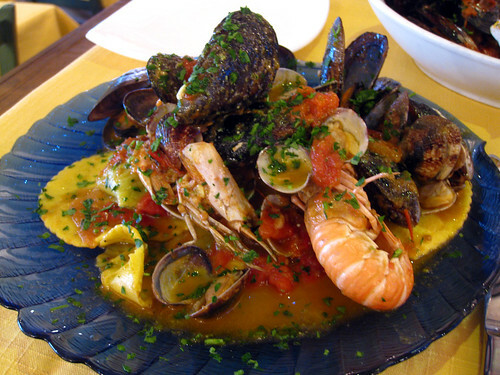 The seafood itself was fresh, but the ravioli left something to be desired. Once we finished eating, we resumed our hunt for Trastevere and as luck would have it, it had been less than a block away all along. Melody and I wistfully walked past postcard-perfect trattorias and restaurants advertising stewed oxtail, truffled pasta, and fresh sugo, wishing we’d been a little more patient. 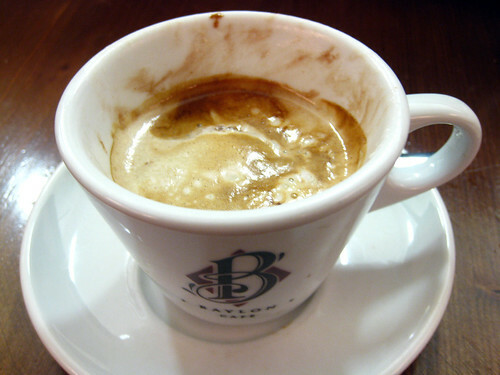 We still wanted to soak up a little of Trastevere, so we stopped at Babylon Cafe for a drink. 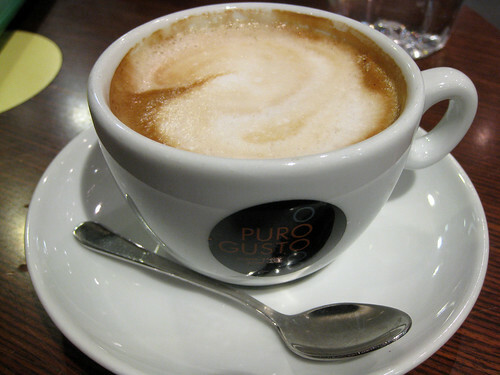 I had the hazelnut affogato, a delicious blend of creamy gelato and warm, energizing espresso. A word of caution: Babylon Cafe has all kinds of NSFW artwork adorning the walls as we discovered halfway through our drinks, so be forewarned if you’re traveling with the kiddies. There was one other stop we had to make before we called it a day. We got on another bus to head towards Volpetti, a deli my friend Menyui had told me about while I was planning this trip. 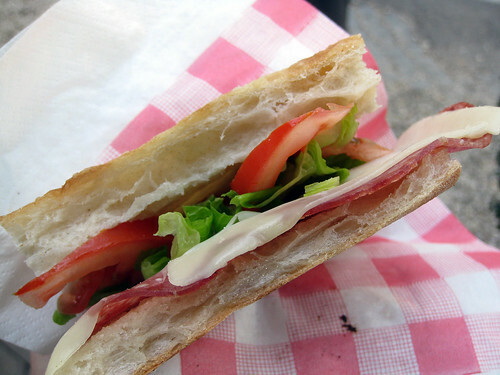 Located in the Testaccio neighborhood, Volpetti is arguably Rome’s best deli. The quality is top-notch, but it comes with a price tag. 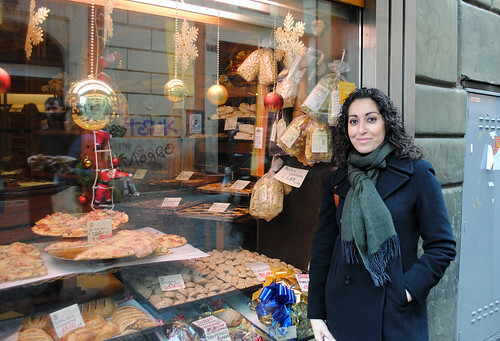 The friendly butchers behind the counter fed us samples of truffled salami and Parmesan while we perused. I bought some truffled honey and other goodies to take home. We’d wanted to go to nearby Da Felice for dinner, reputedly a favorite of Roberto Benigni’s and well-known for it’s homestyle Roman fare, but it was closed. Dejected, we got on the bus and headed back to our hotel. We were only temporarily disappointed though, as we’d have a chance to make up for it the next day. Melody and I had decided to spend the day at Vatican City, so we stopped at Dolce Maniera, a tiny, underground bakery near the Ottaviano-San Pietro metro station. 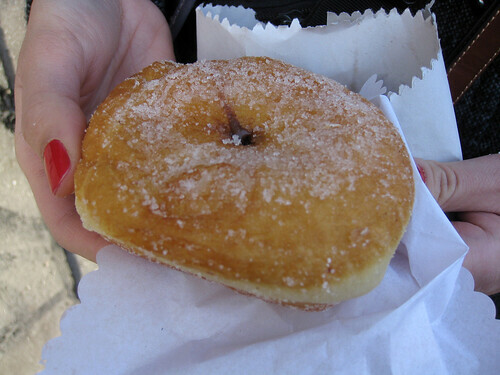 I enjoyed my sugar bomb Nutella doughnut with an espresso at a nearby cafe, and off we went towards Via di Porta Angelica to reach St. Peter’s Square. 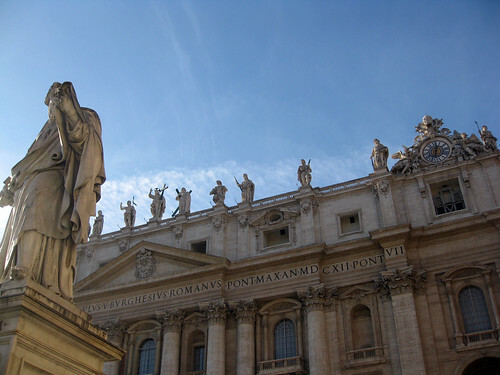 As expected, St. Peter’s Square was flanked by tourists waiting to enter one of the world’s most famous sights, and the line to get into St. Peter’s Basilica circled across the entire square. After an hour’s wait, we were in. Most of the signs were in Italian and since our Italian leaves a lot to be desired, we had no idea what we were getting ourselves into when we followed the sign for the cupola. “What’s a cupola?” we asked each other. 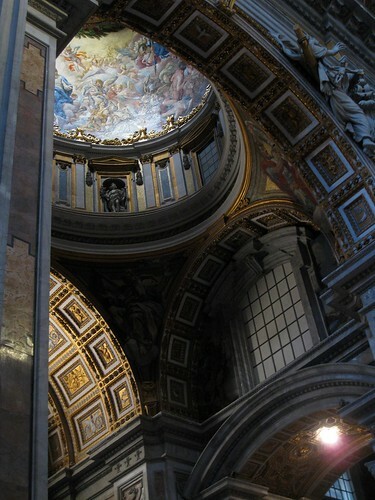 As it turned out, we’d inadvertently begun climbing what seemed like a never-ending narrow staircase up the tallest basilica dome in the world. Change your mind and want to turn around? 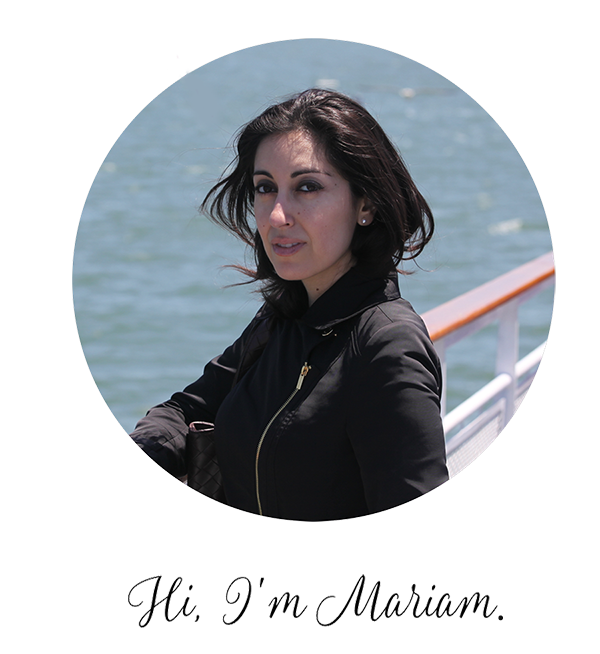 Not at this cupola you can’t. Thankfully, the view was worth it. Back at the front of the basilica, we entered the first chapel, and henceforth all other chapels will pale in comparison to this one. Michelangelo’s Pieta is here, and the basilica is a testament to Renaissance-era art and architecture. After several hours in the basilica, we were famished, so we rushed to find a neighborhood eatery that I’d marked as a to-eat. 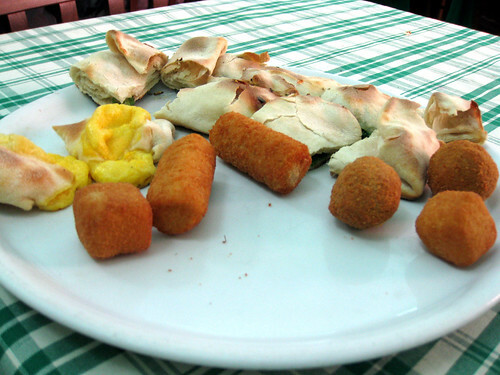 Dino e Tony is every Italian generalization you’d ever imagined, rolled up and served on a huge, loud platter. We stepped in just before closing, and were greeted by Dino, who seemed annoyed at our inability to properly order in Italian. No matter, he took it upon himself to decide what we were eating, and that’s how we ended up eating five plates of food in less than two hours. 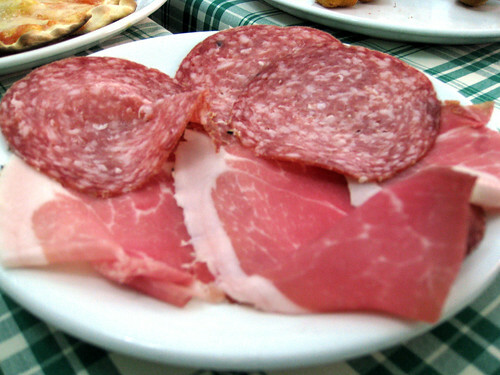 First came the salami and proscuitto. Then came the pizza margherita and pizza bianca. And of course you had to have the antipasti platter. 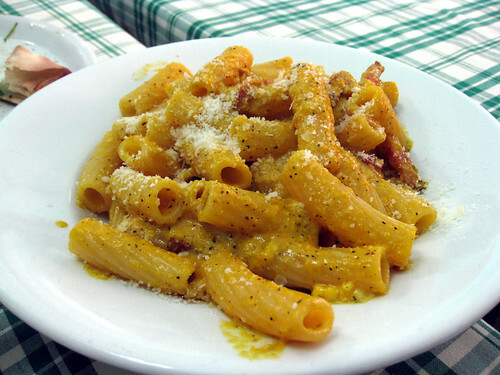 Then, Melody’s penne carbonara arrived. 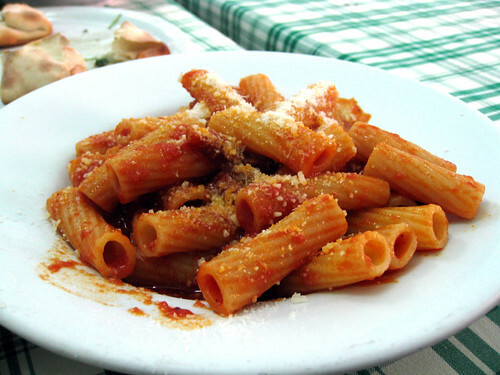 Finally, my penne all’amatriciana came. Of all the dishes, the garlicy, perfectly al dente penne was my favorite. The antipasti platter was too salty for my taste, and well, we really didn’t need all that food anyway. Still, the experience was lots of fun, even if we came across as silly Americani. We had one last stop before we left Vatican City: Castroni, a neighborhood deli with everything from loose-leaf tea to squid ink pasta to artichoke preserves to truffled sea salt. 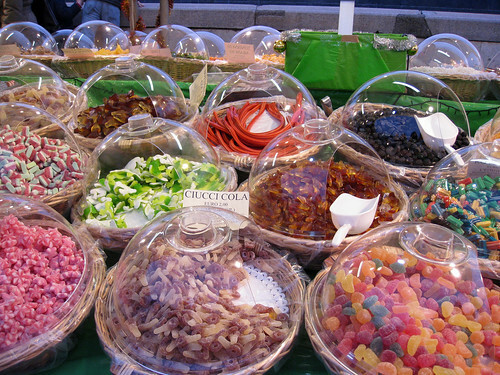 Melody and I selected a few delicacies to take home with us, and we rushed back to the metro to get to our next stop: Piazza di Spagna. 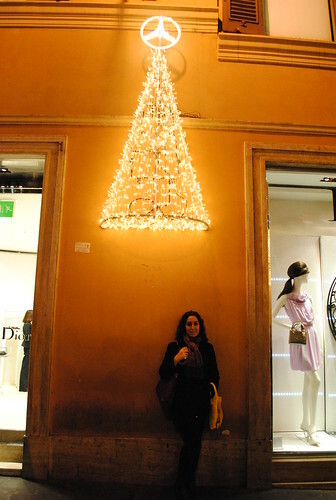 The Spanish Steps were packed with revelers, so we bypassed the area and went straight for Via dei Condotti, flanked with high-end boutiques and the well-to-do. We walked through Via dei Condotti and past Piazza del Popolo (which was a hot spot for executions centuries ago but today sits adjacent to Fendi, Gucci, and Dior boutiques) before deciding to head back to our hotel for the night. 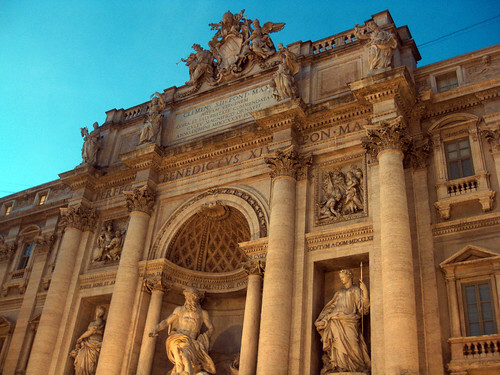 We’d only scratched the surface of Rome, and yet we had so much more to see. 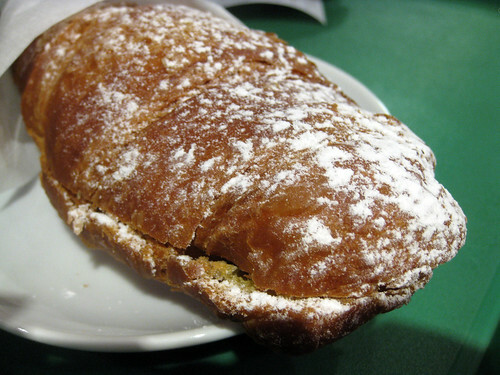 I had a capuccino and Nutella brioche – not the healthiest of breakfasts, but a delicious one. 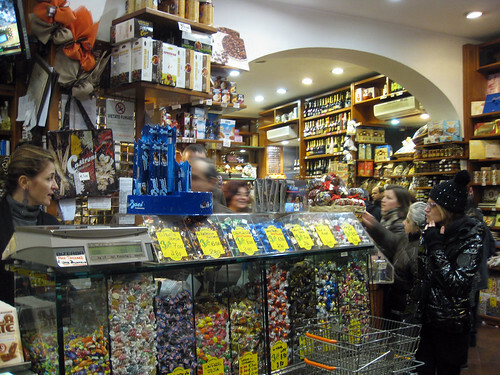 I’d quickly learn that in Rome, there is Nutella-flavored everything to be found – not that I’m complaining. We found our bus at the terminal outside the station and headed towards Campo de Fiori. 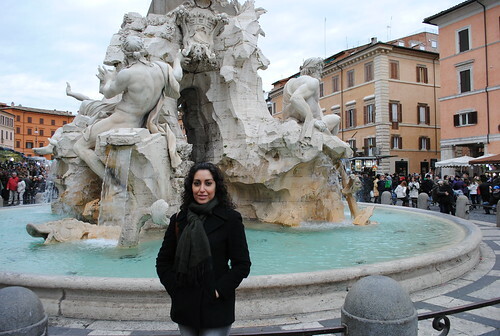 Once we arrived, we wandered off in the wrong direction and ended up at Piazza Navona instead, a huge square lined with baroque architecture – a church, a palace, statues, and a couple fountains. In other words, a quintessential Italian postcard. Because it was the holiday season, the square was packed with families and tourists who were in turn being flanked by vendors selling kitsch and roasted chestnuts. 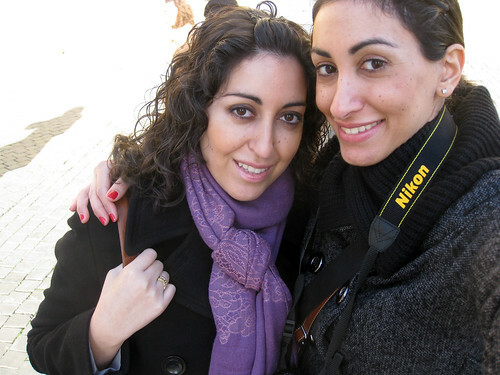 Melody and I bypassed crowds and made our way around the square, bumping into where we had set out to visit: Campo de Fiori. 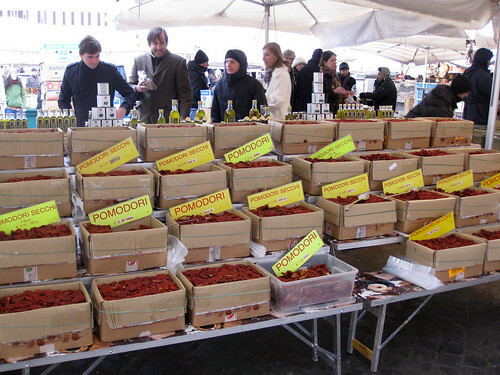 Originally a meadow (campo de fiori means “meadow of flowers,”) today the area is a colorful maze of food stalls, restaurants, vendors, and side streets. I’d done my research ahead of time and knew this was the site of a couple of restaurants I wanted to eat at, so when we spotted Obika, the mozzarella bar that was on my list, we decided to have lunch. That’s right, a mozzarella bar. Situated in a corner of the square, Obika is a chic space, complete with alcohol-serving bar and well, mozzarella-serving staff. 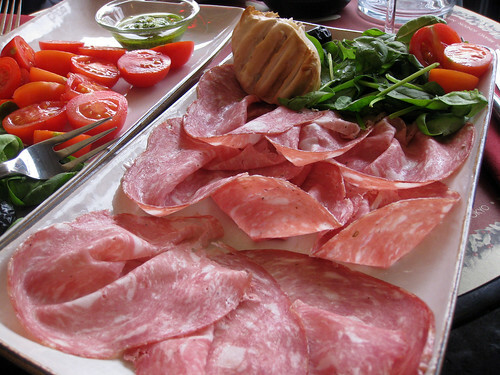 Once seated, we ordered a couple of mix and match platters choosing our mozzarella and accompanying meats and vegetables. I had a glass of Nero d’Avola on the side; Melody had black tea. 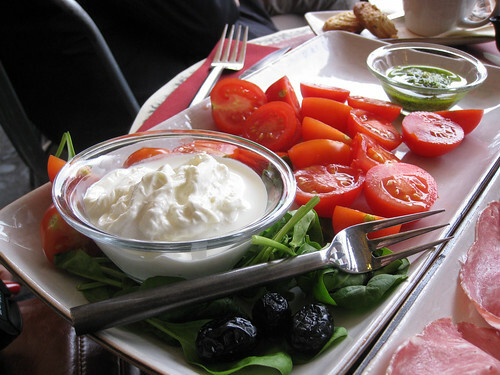 My favorite type of mozzarella is burrata – gooey and slightly sweet, and super fresh. This was served with cherry tomatoes, spinach, salt-cured olives, and the best pesto I’ve ever tasted. We also had a plate of smoked mozzarella with handmade mortadella, tomatoes, and olives. This mozzarella was much denser and had meaty quality, which helped it stand up against the mortadella. 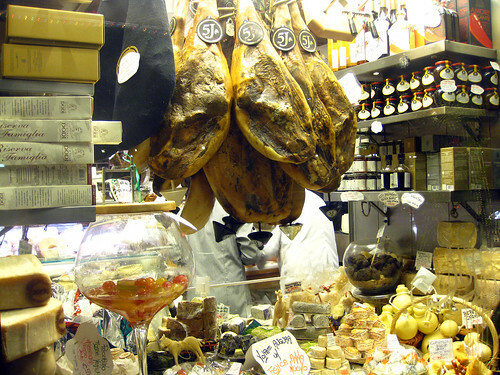 Fully sated, we began exploring the rest of Campo de Fiori, which was already closing up shop midday. Touristy-ness aside, you can get almost anything here: fresh produce, dried tomatoes, pasta of all shapes and sizes, and of course, limoncello. 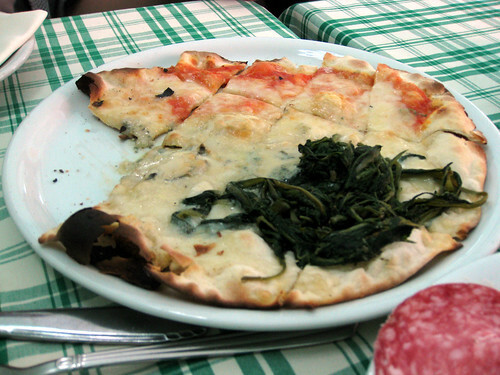 Right as we were about to leave, I noticed Forno Campo de Fiori, another one of the eateries I’d marked as a to-eat. Afraid we might not get another chance to return to the neighborhood, Melody and I went in for a slice of pizza. Sure, we may have just eaten a pound or two of cheese, but there’s always room for pizza, right? After wrangling a couple of slices at the busy counter (it was my first time ordering pizza al taglio, which is cut and then weighed), Melody and I stood outside (there is no seating at Forno Campo de Fiori) and dug in. 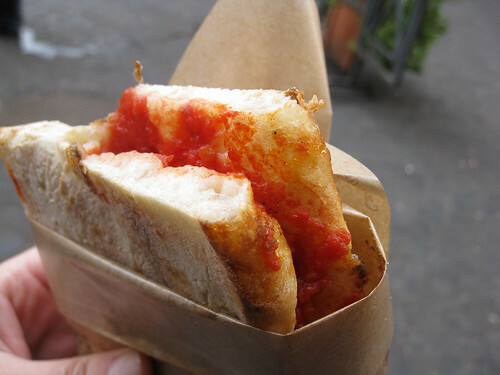 No cheese, just a thin layer of sauce, but oh so good. The thin, chewy crust was just out the oven and warmed us in the cold December air. Lunch number two out of the way, Melody and I headed over to Via del Corso for some posh (mostly window) shopping. 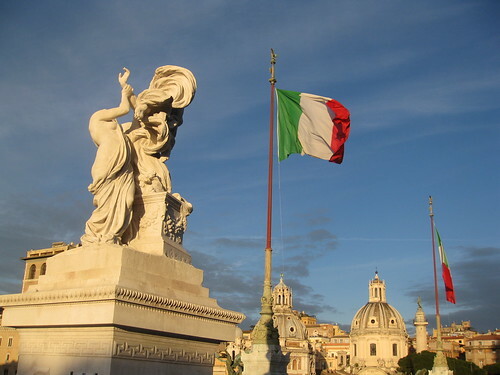 We circled around to Piazza Venezia, which leads to the Monument to Vittorio Emmanuelle II. 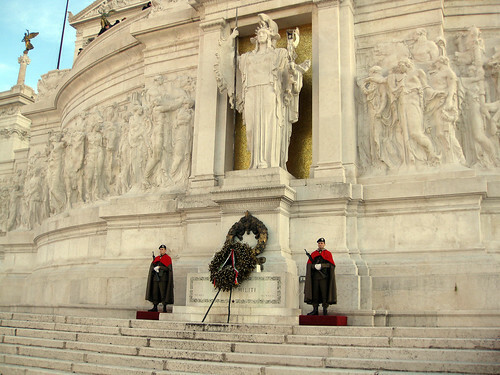 The monument was built in honor of Victor Emmanuel, the first king of a unified Italy, and as far as Italian monuments go, this one is pretty recent. It wasn’t completed until 1935, and it is huge. 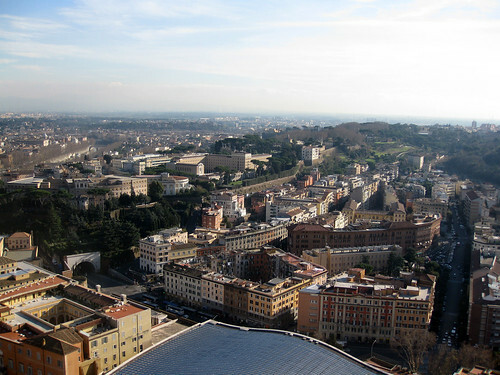 Despite lacking a dome or a tower, it’s visible from most of Rome, and having been constructed over a medieval neighborhood, it’s invited a fair share of controversy. On the other hand, the monument affords some gorgeous views. 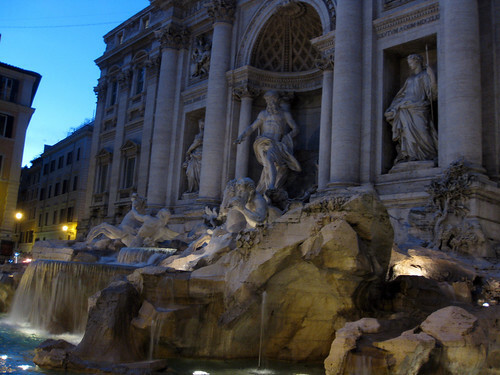 It was getting dark, so we headed over to Rome’s most well-known sight: Trevi Fountain. By going early we’d hoped to avoid the crowd, but we arrived to a few hundred revelers crowding around the fountain. We hung around a little longer, threw the ubiquitous coins in the fountain, and called it a night. We had trouble finding an open restaurant in the neighborhood that wasn’t a McDonalds or an equally touristy joint, so we grabbed a quick bite at Termini Station before heading back to our hotel. After all, we’d already eaten two lunches that day.